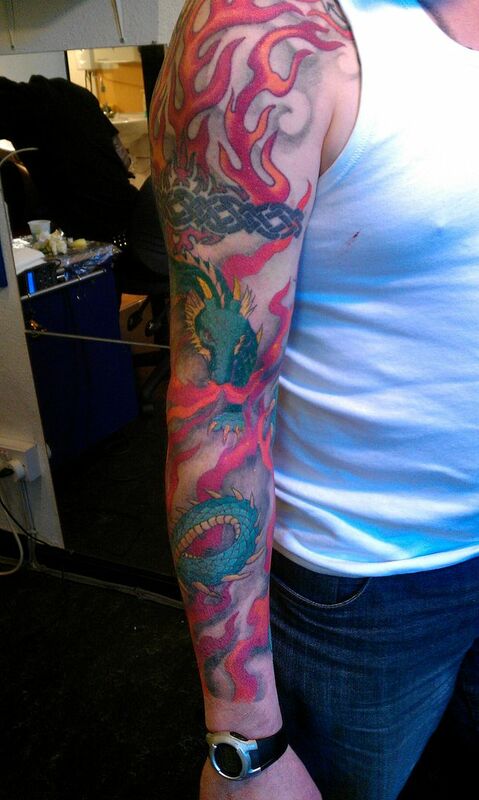 Scott also got his tattoo finished, in his case a full sleeve, with a dragon, a foo dog, a peonie and a wee picture of his daughter. 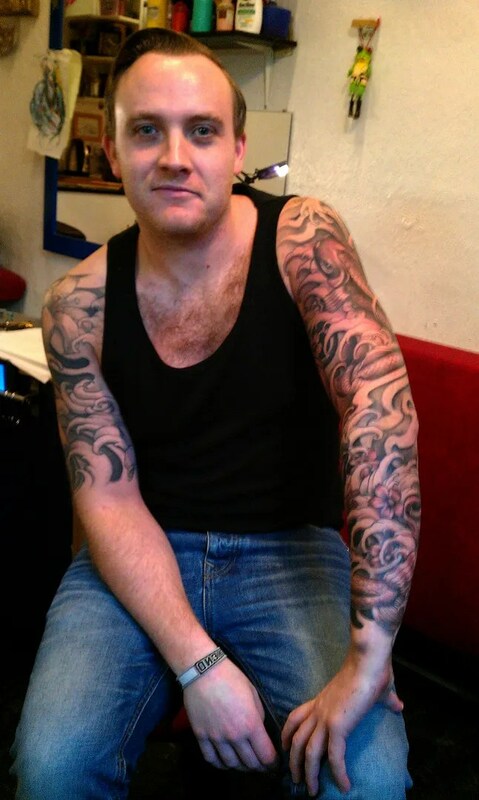 Scott now has two sleeves, which we did this year, so his transformation has been quite remarkable! 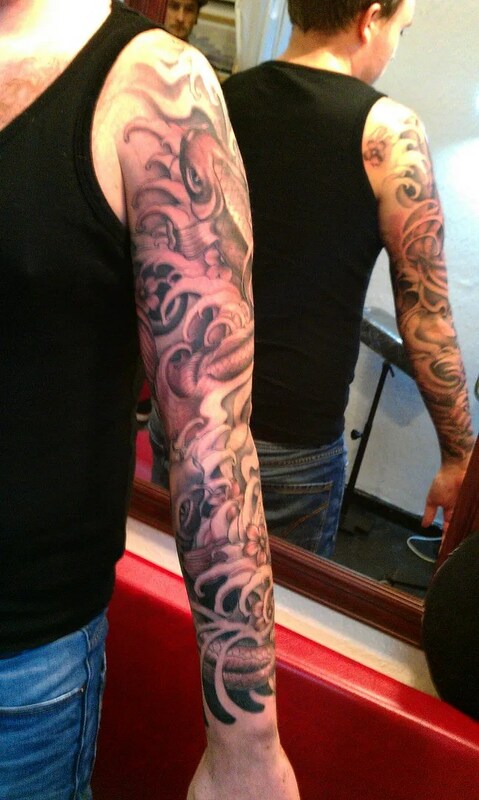 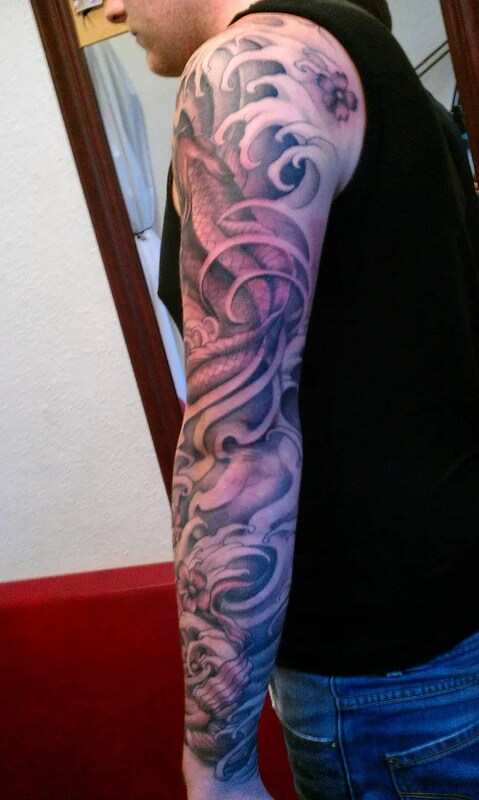 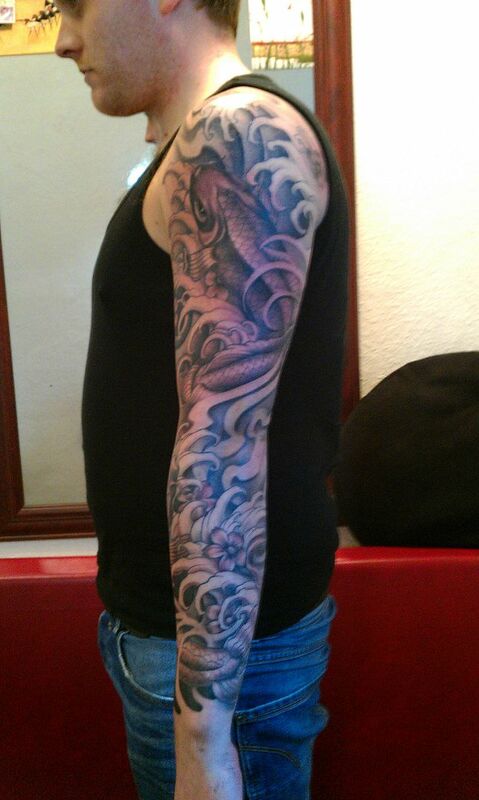 and a new sleeve for david! 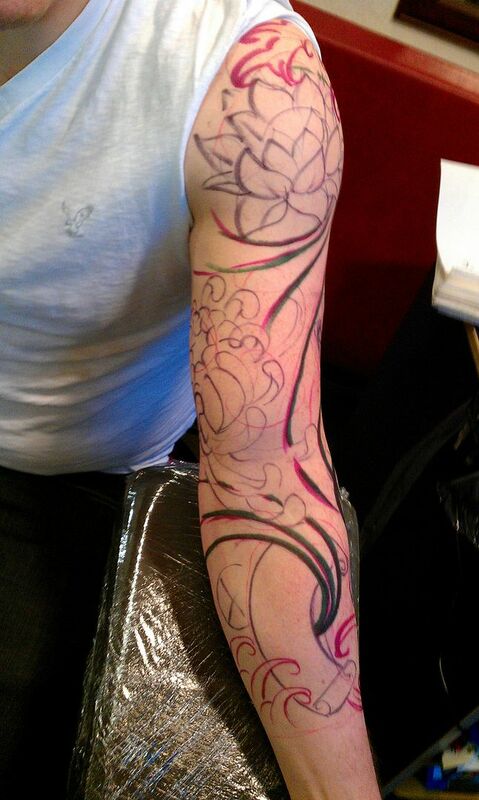 I’m showing you the drawing before i started tattooing, as it turns out these random looking scribbles are of interest! 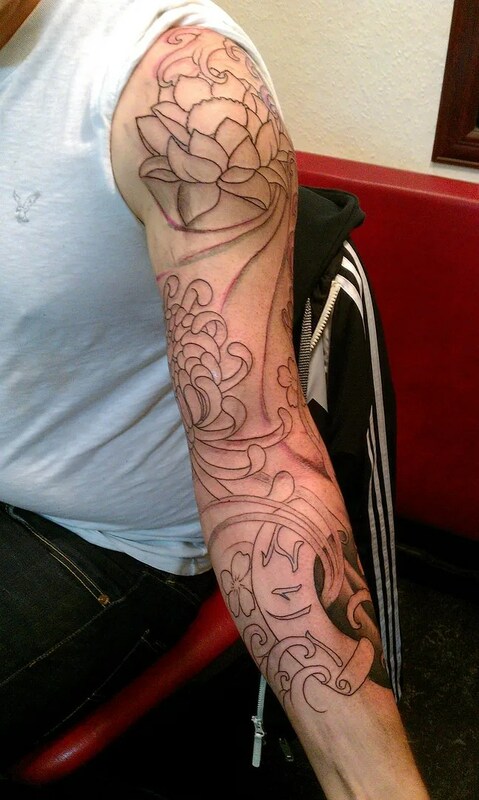 I was reluctant to post pictures of my preparatory freehand drawings, in case people are put off by how rough they look, but the feedback I have been getting is that they are interesting, so here goes. 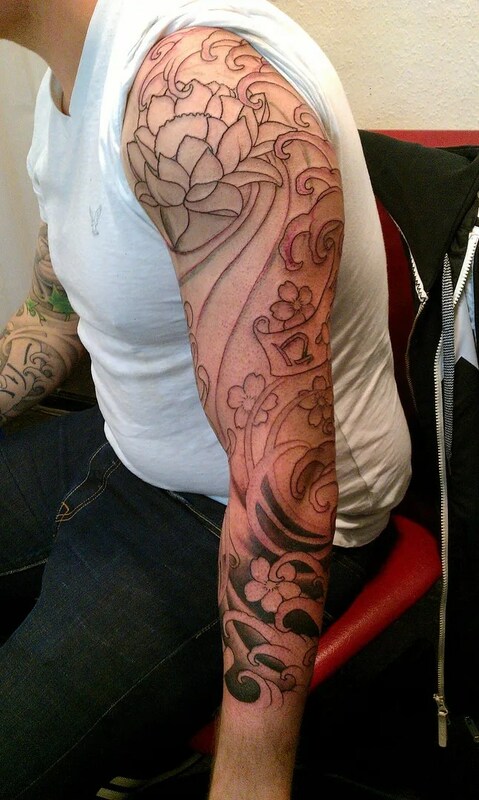 we outlined the sleeve and will get more of the shading done next time, and also a bit of maybe more muted colours, so that this sleeve doesn’t upstage the other arm, which is mostly black and grey. 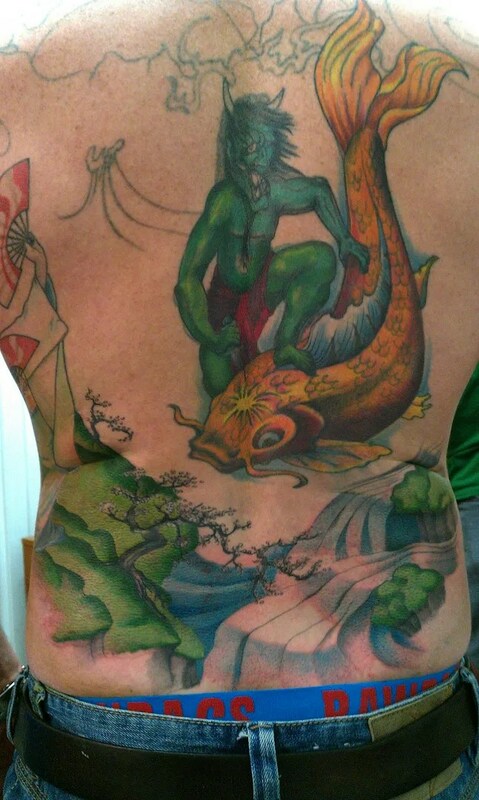 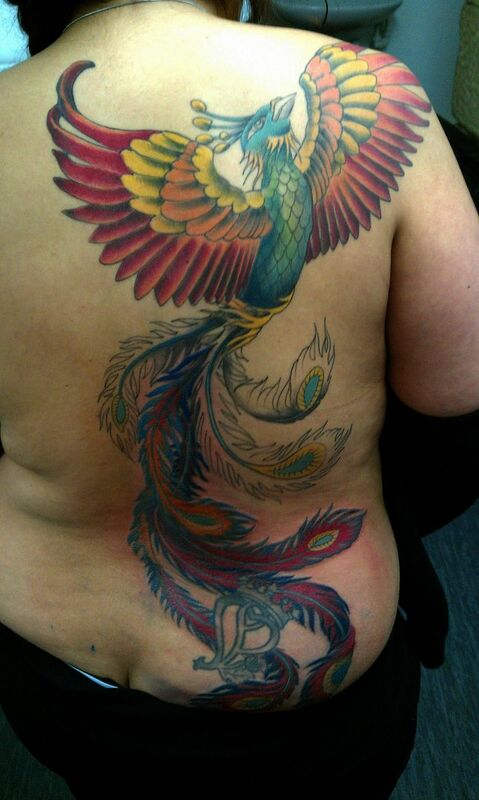 I am in the process of helping barry with his backpiece. 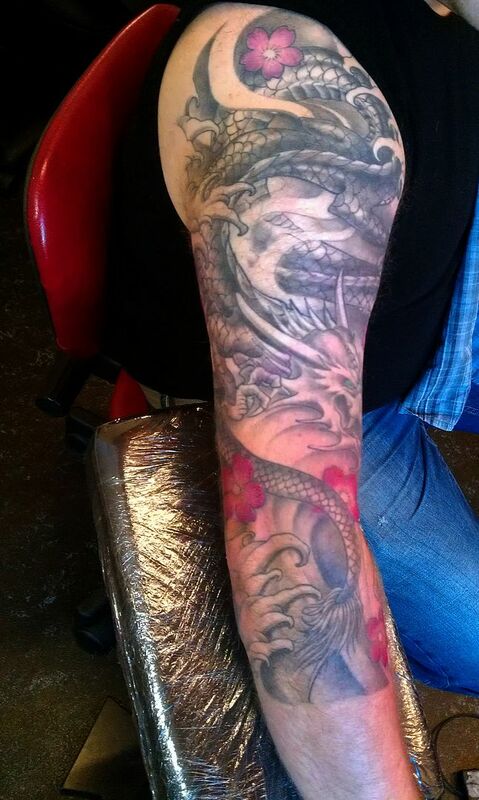 He trusted his tattooist before me to freehand a beautiful japanese scene with a samurai, koi, seascape, sunset, clouds etc, but noticed too far in that the artist was way out of his depth. 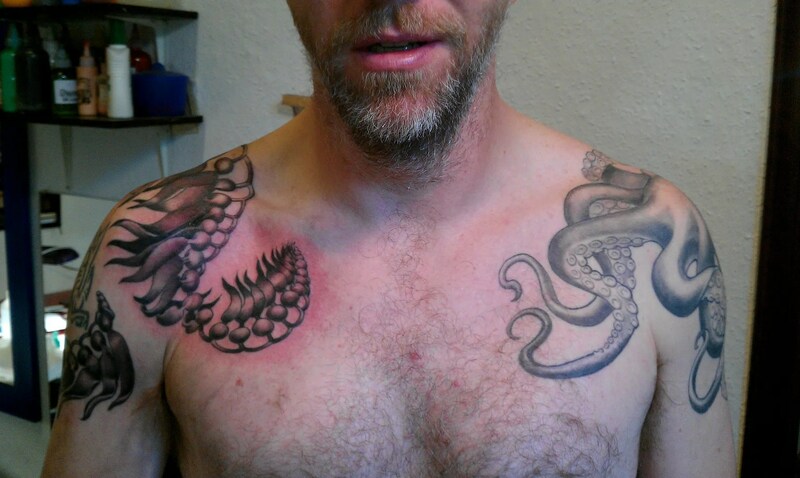 The crazy line work at the top of the piece is getting lasered by Roz, and I have tried to rescue the monster with the fish (still in progress). 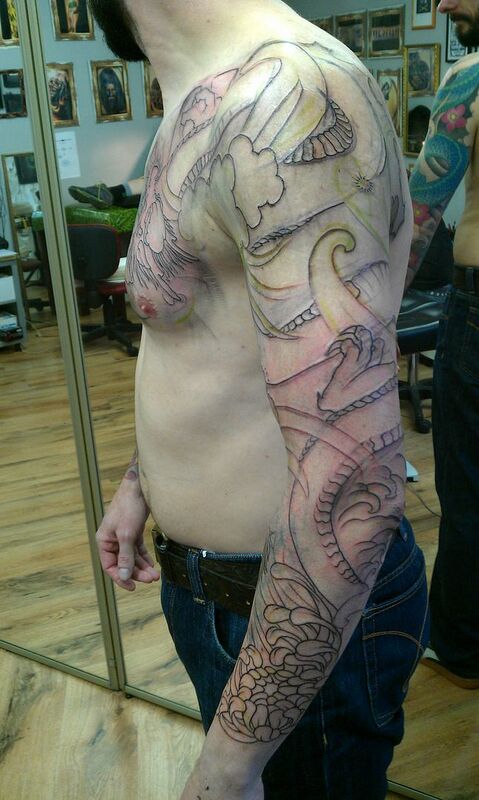 I am also adding a land and sea scape at the bottom of the scene and will work my way up as the lasering continues. 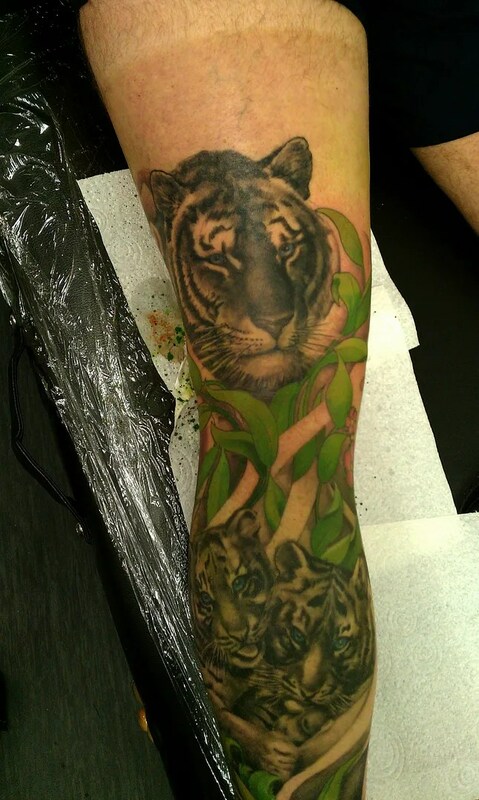 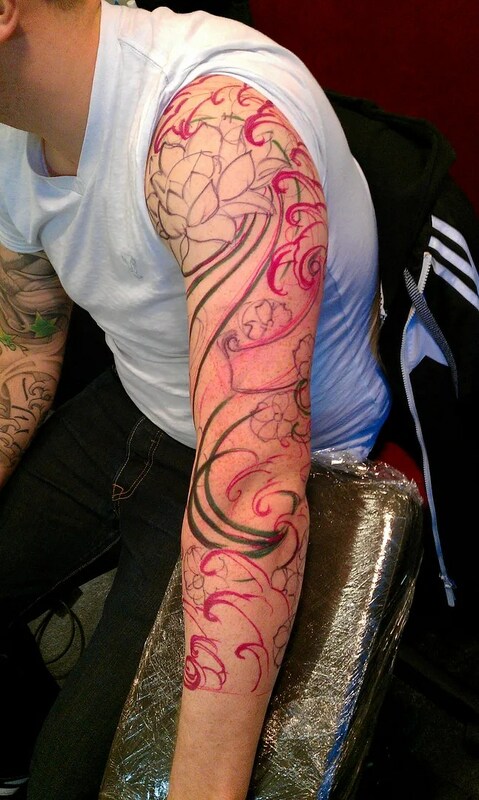 Derek is getting his sleeve finished, today we added the last of the colour, although I’d like to give it the once over after it has all settled. 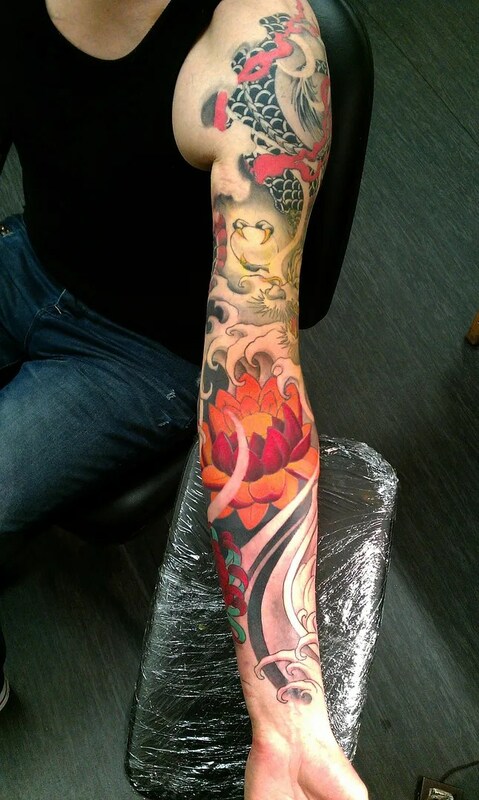 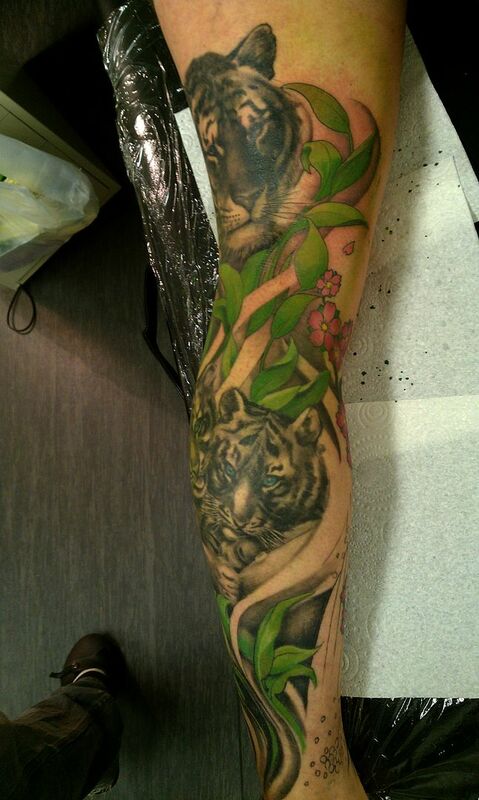 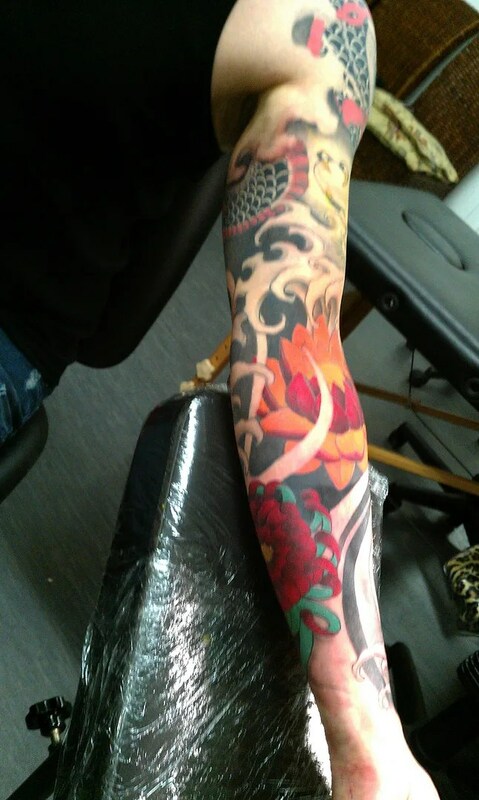 We did the upper part of the sleeve a couple of years ago, and when there is a gap like that between section, I like to see how it all blends once it is healed. 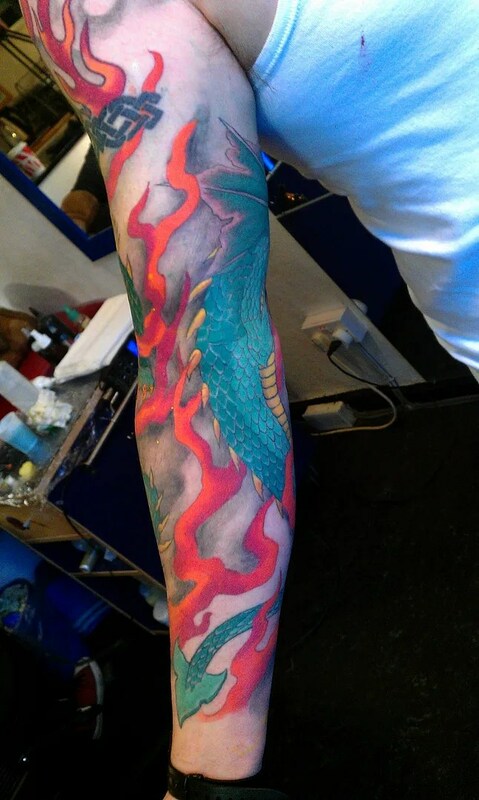 Brian is starting on another epic journey, now that his blue- green dragon is done, we are adding another on the other side, this one will be in reds and oranges. 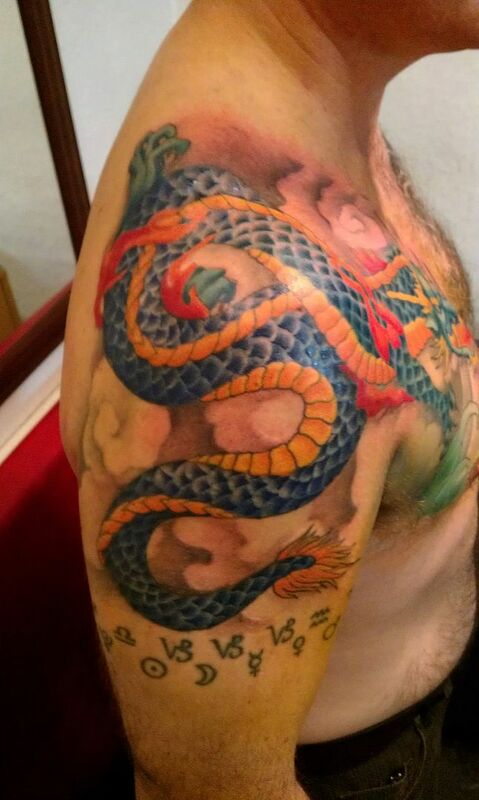 Similar position to the blue one, but not a copy and with a few touches of it’s own. 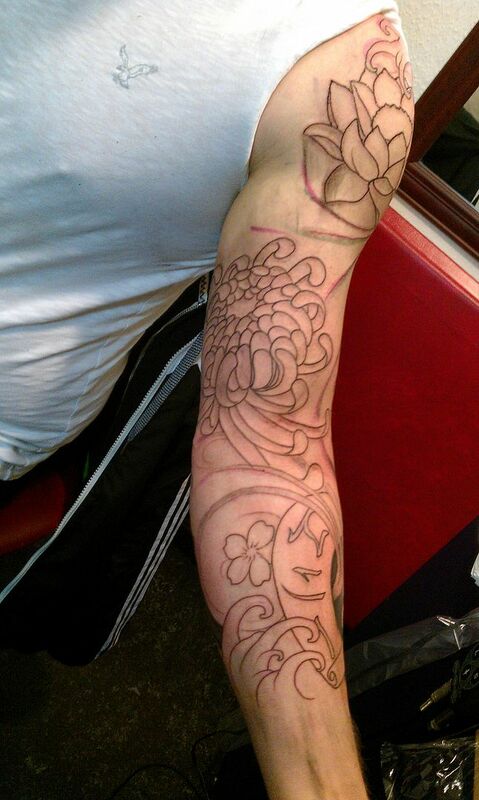 we nearly ran out of time on this session, and I had to just sketch the lines as we went up from the elbow. 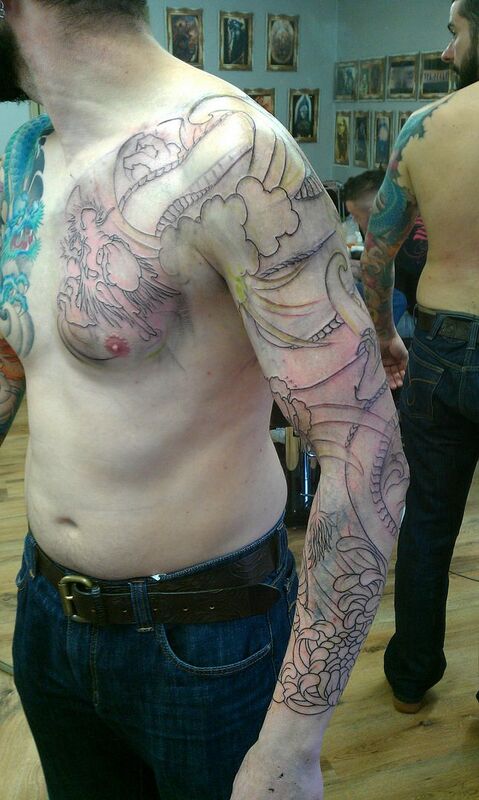 I didn’t want to lose the drawing we had worked out and have to draw it on again next time. 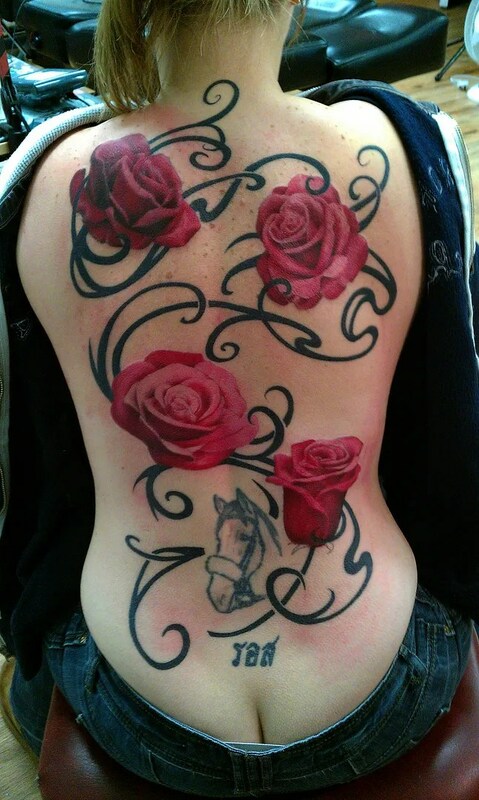 I’ve still got some finishing to do on the roses, and I will be improving on the old horse tattoo at a later date, too. 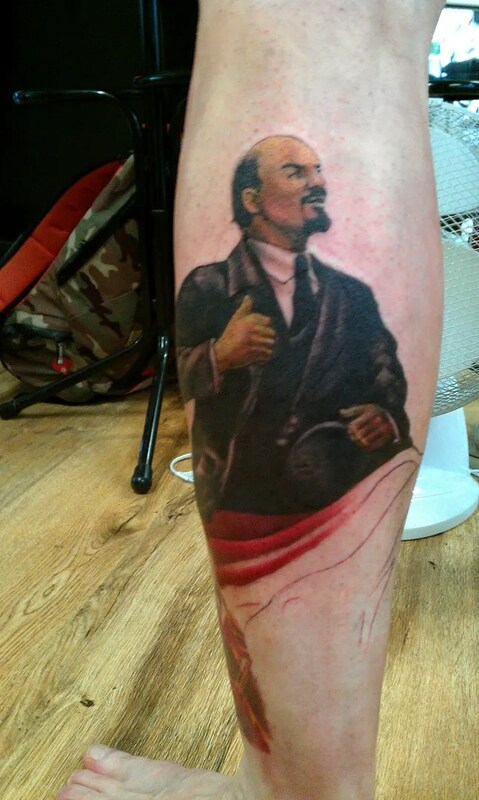 Brad is working on a full leg of left wing political images, both of his legs in fact. 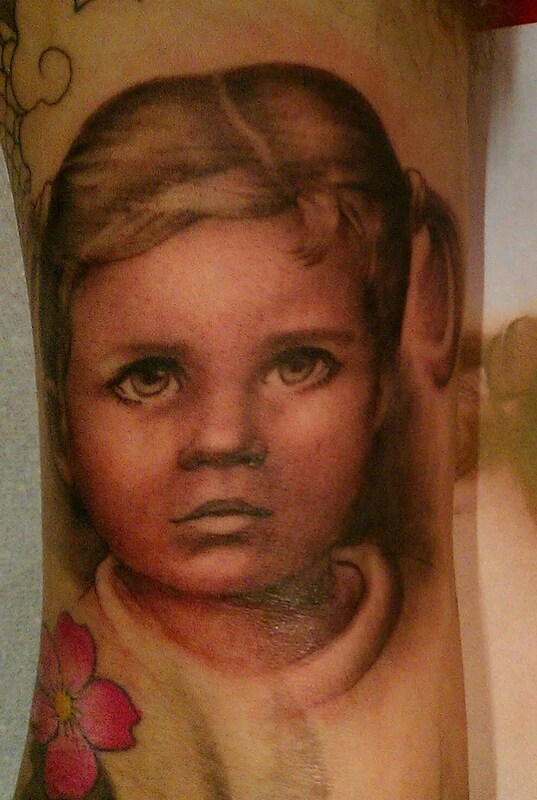 We have done anti war images and iconic propaganda/ art, pieces that have a personal meaning for Brad. 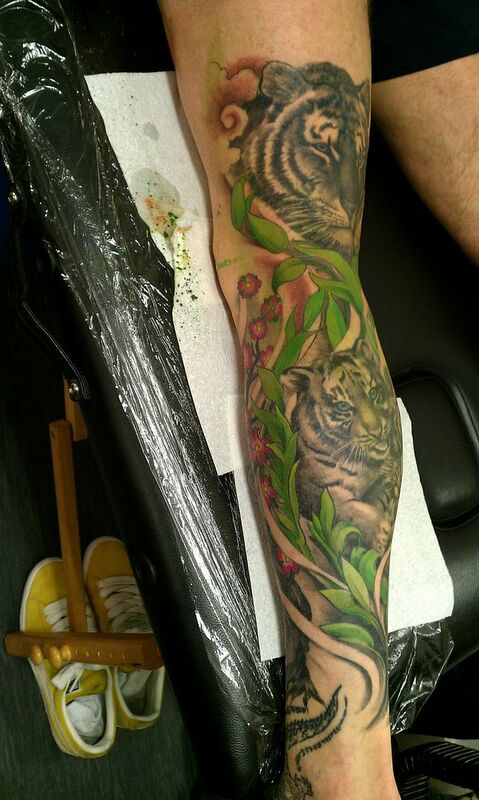 I find leg tattoos really interesting. 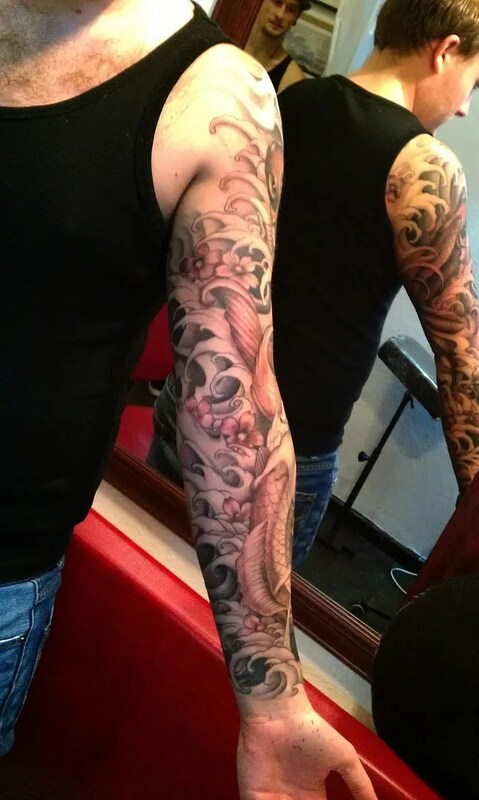 It’s less ‘public’ skin than the arms, and i have observed that people often get more personal or quirky things on their legs, tattoos that can easily be hidden and don’t need to be explained to the general public. 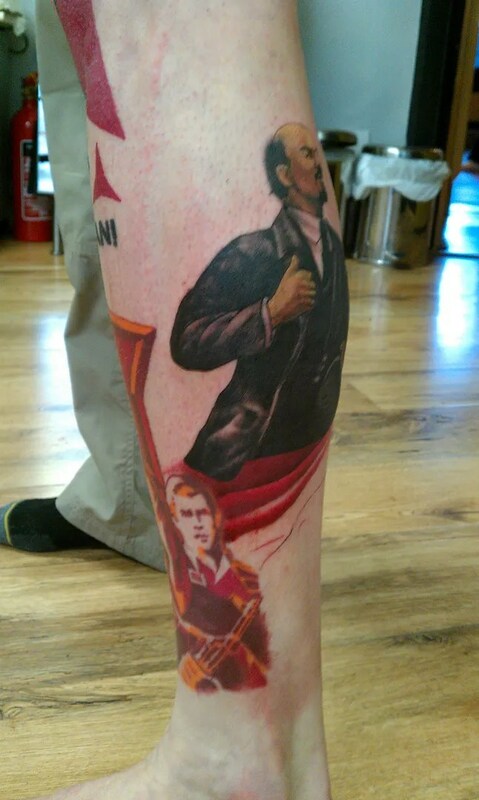 today we added the beginning of an image of Vladimir Lenin with the red flag, there will be some of the crowd he is addressing. 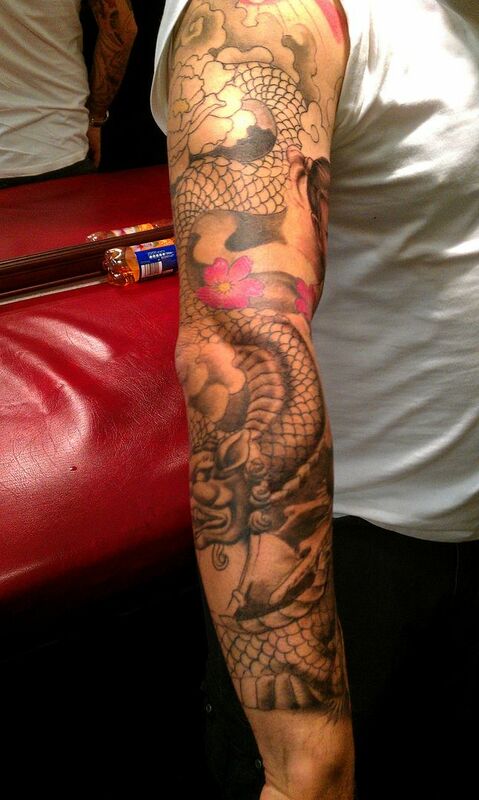 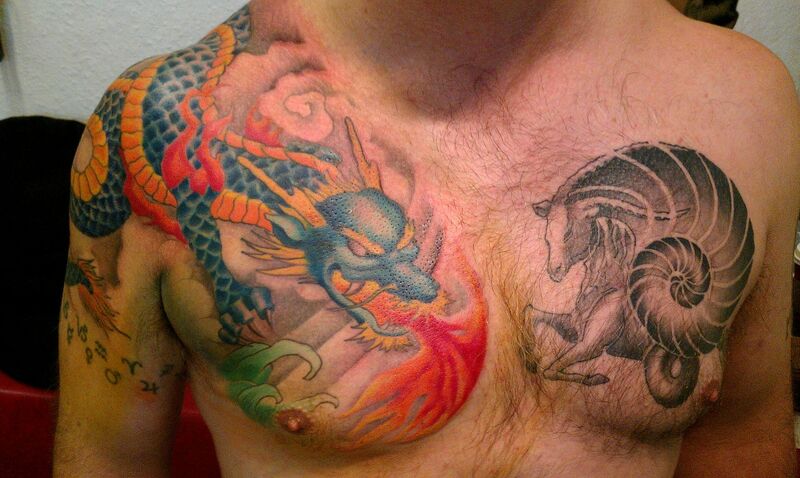 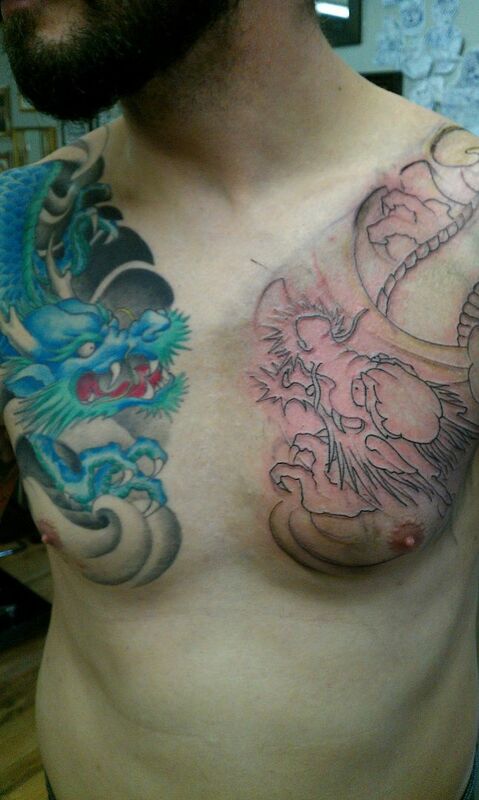 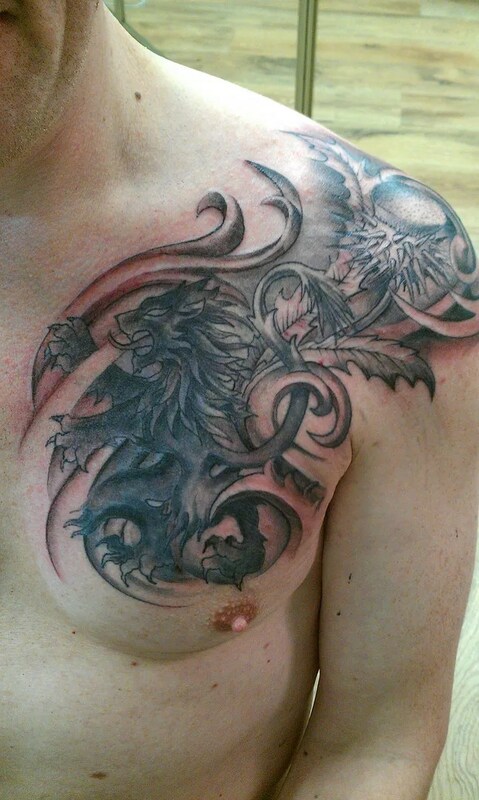 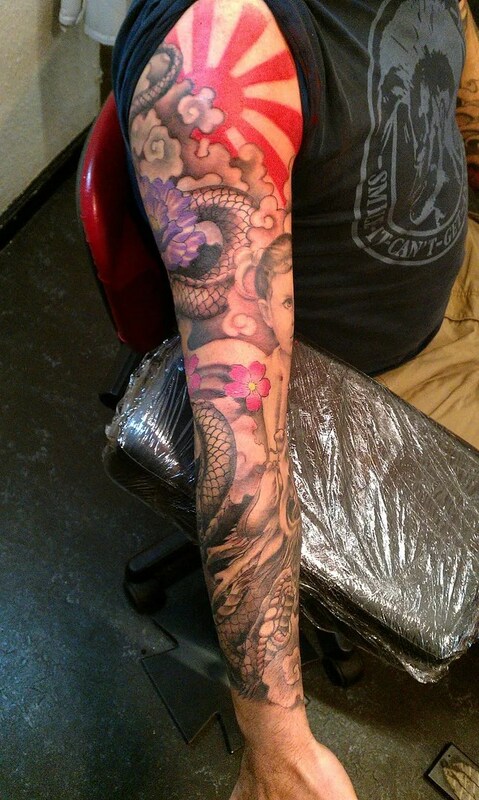 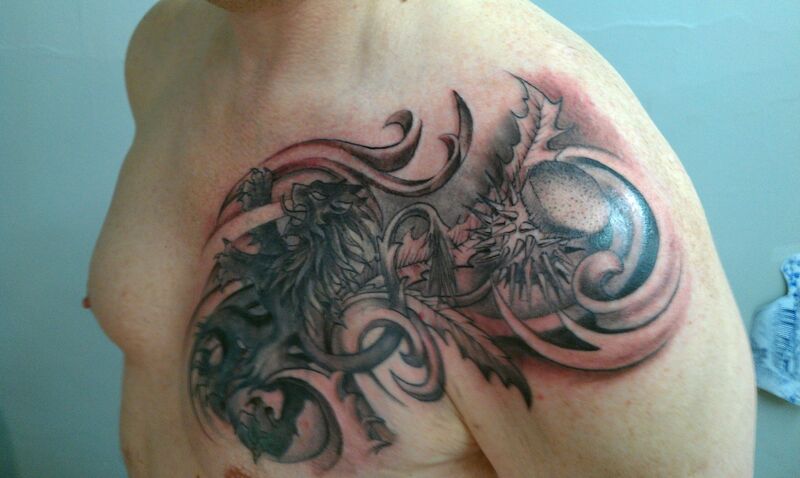 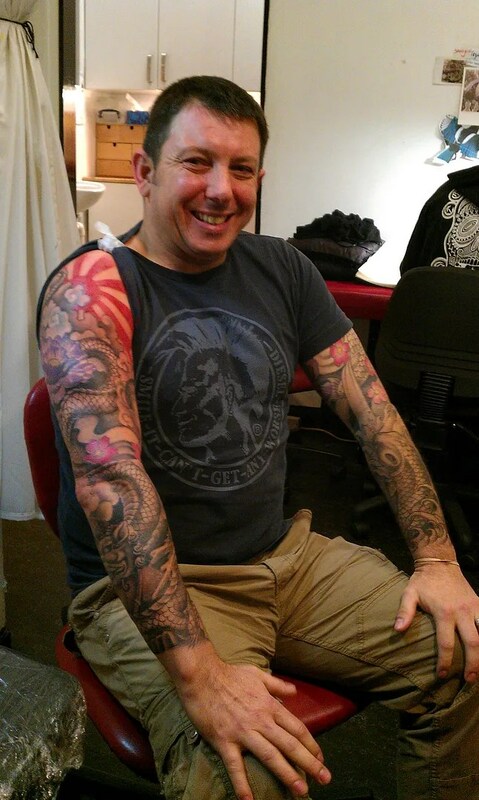 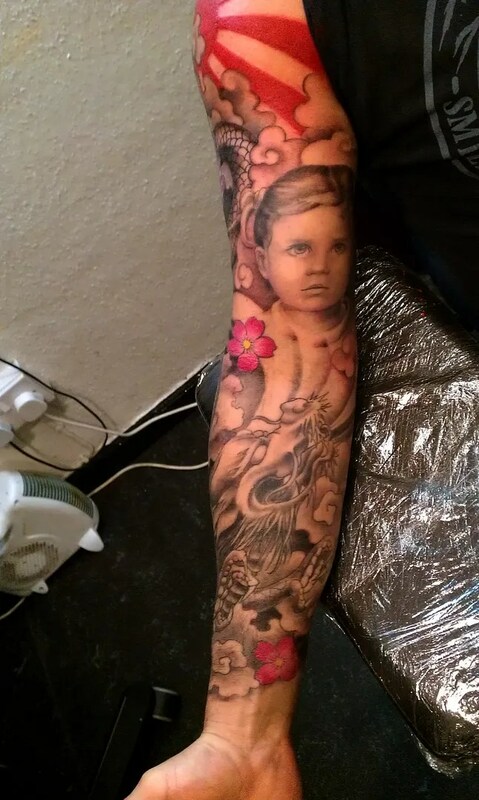 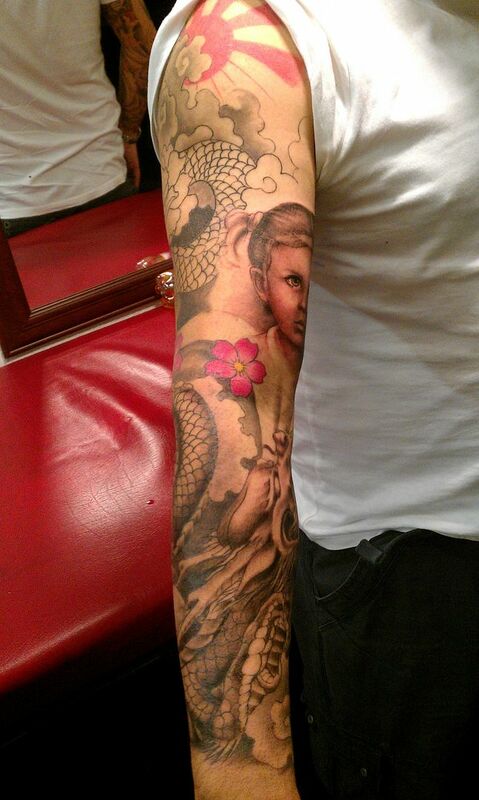 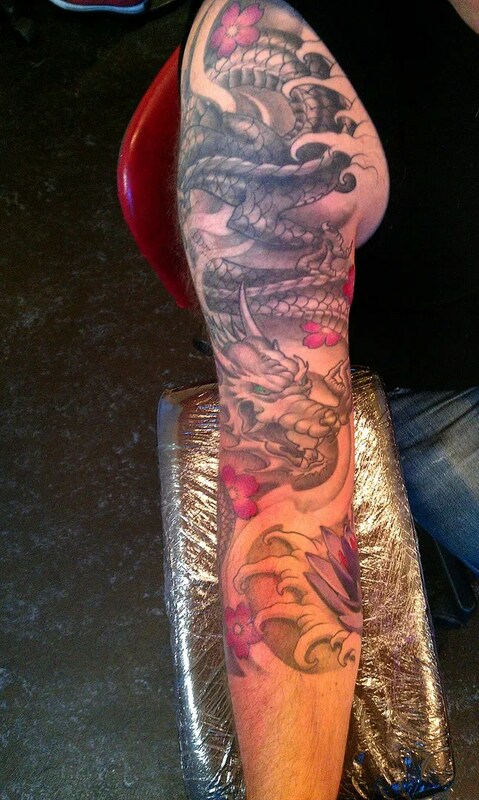 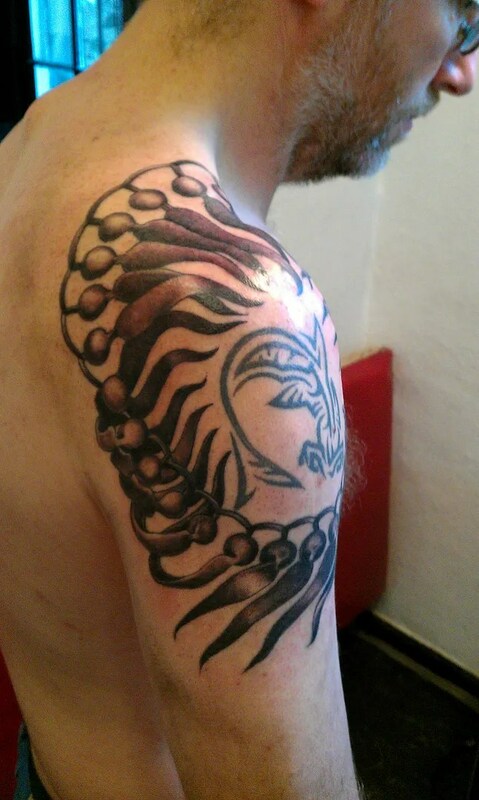 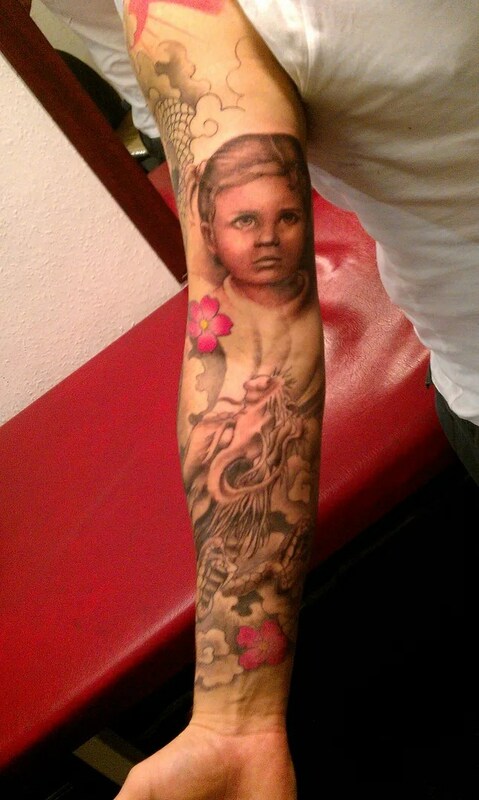 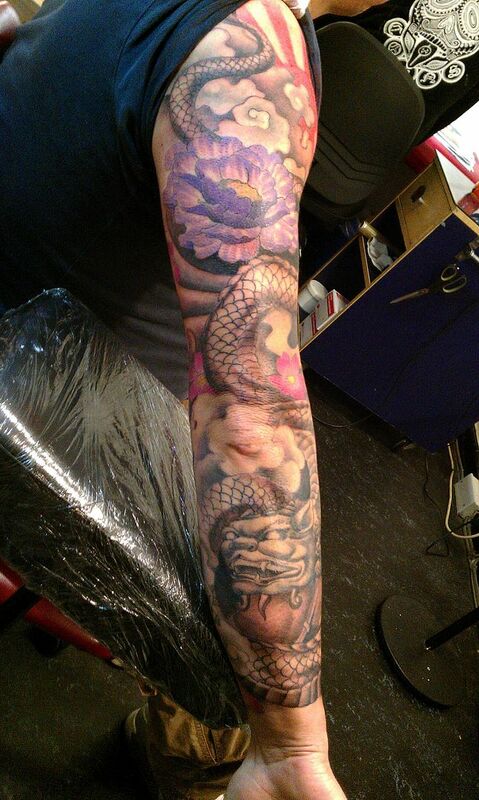 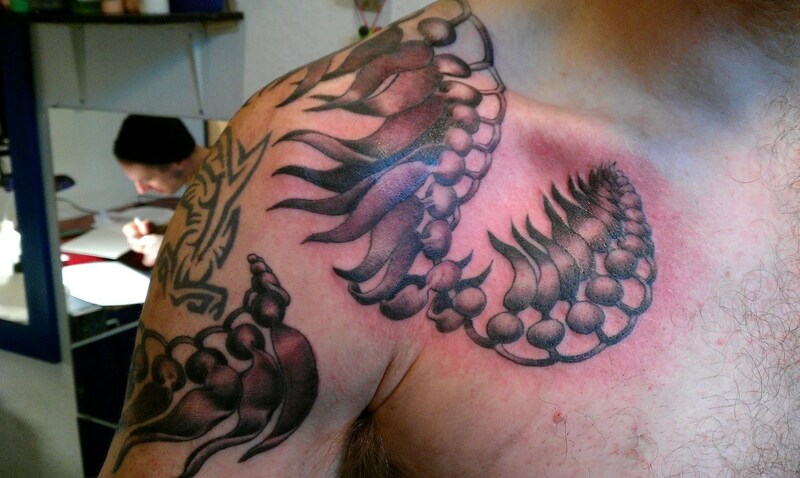 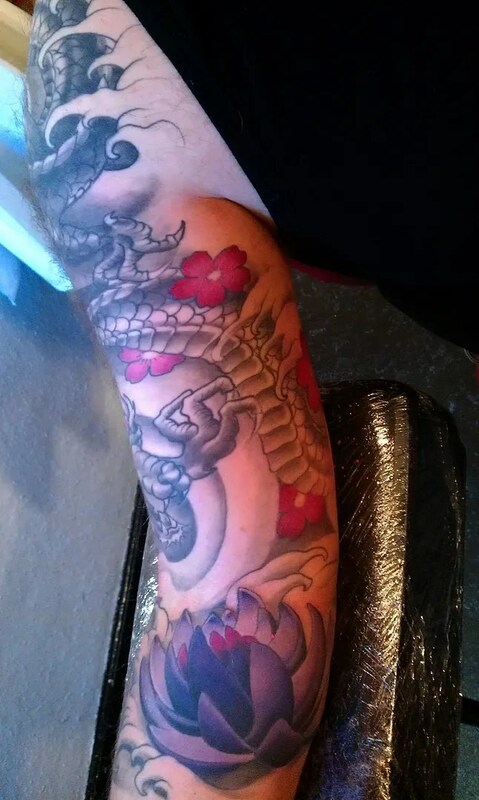 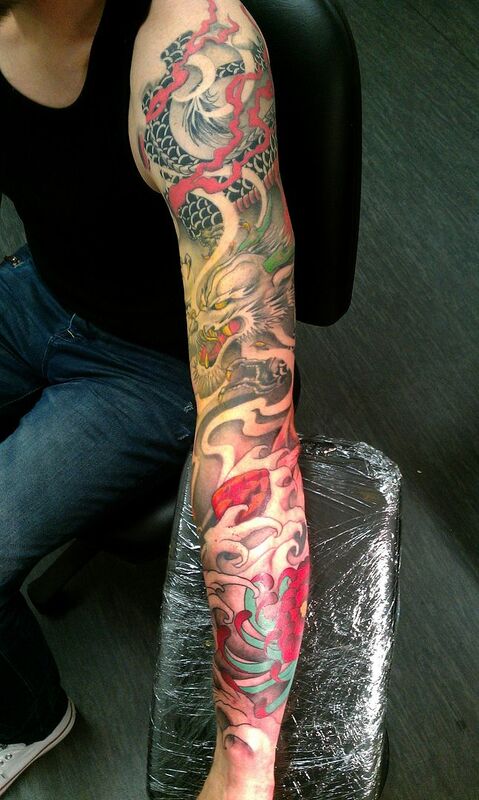 Scott is working on a dragon sleeve, with a portrait of his daughter incorporated on the underside of the upper arm. 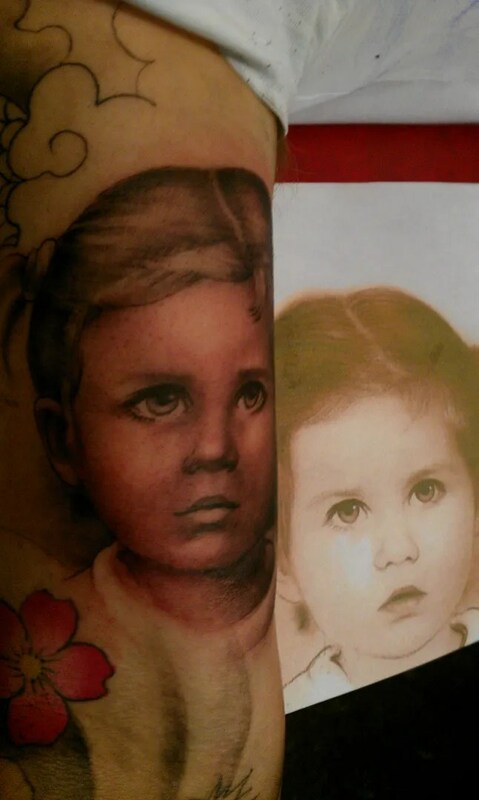 the picture Scott brought in was a drawing done of the daughter when she was a young girl- she is 17 now- but both father and daughter liked the drawing so much that this is the picture they chose.